United Nations chief Antonio Guterres on Thursday appealed for dialogue to stop Venezuela’s political crisis spiraling out of control after opposition leader Juan Guaido declared himself interim president. The United States, Brazil, Columbia and other nations on Wednesday endorsed Guaido’s declaration in rejection of President Nicolas Maduro, as more protests rocked the economically strapped country. Spain, Mexico, Bolivia, Russia, and Turkey are among other nations who have refused to recognize Guaido. How exactly the political crisis will end remains unclear at this time. Following U.S. President Donald Trump’s decision to recognize Guaido as interim president, Maduro severed ties with the U.S. and expelled its diplomats, giving them 72 hours to leave the country. Shortly after, Secretary of State Mike Pompeo released a statement saying the U.S. will not comply with the order because it no longer recognizes Maduro’s authority to issue it. 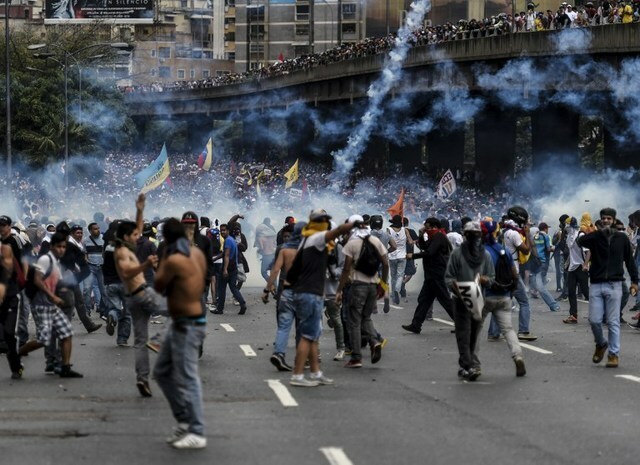 Twenty-six people have been killed since the latest wave of protests since it broke out four days ago, the Caracas-based Observatory of Social Conflict said Thursday. “Sovereign governments have the possibility to decide whatever they want,” the U.N. secretary-general said on a Facebook Live broadcast from Davos. “What we are worried (about)… is the suffering of the people of Venezuela,” he said. Trump said Wednesday that the United States will hold Maduro’s government responsible for any violence related to the political turmoil. U.N. High Commissioner for Human Rights Michelle Bachelet also said she was “very worried” about the developments in Venezuela. “We hope that there will be a peaceful solution,” the former Chilean president told AFP in Davos. Maduro has blamed the country’s economic woes on the United States, which has imposed crushing sanctions on Venezuela and has sought to oust Maduro’s United Socialist Party from power since his predecessor, Hugo Chavez came to power in 1999. Some 2.3 million people have fled since 2015, U.N. figures show, while the International Monetary Fund says inflation will hit a staggering 10 million percent this year. The U.N.’s World Food Program has been shut out of Venezuela by Maduro’s government but is working in border areas to help people fleeing the country. The situation is “heartbreaking,” WFP chief David Beasley told AFP in Davos. “We know that people are starving in Venezuela. We know that it is not isolated incidents of hunger in Venezuela. It is widespread,” he said. It’s unclear what will happen if the crisis is not settled before Maduro’s 72-hour ultimatum, which potentially sets the stage for a dramatic confrontation between his government and the U.S.
On Wednesday, a senior U.S. administration official told reporters on a briefing call that the Trump has not ruled out a military invasion to oust Maduro, saying “all options” are on the table. Fighting between factions of the Venezuelan military also remains a possibility, as military leaders will have to choose which government they are loyal to. Eight generals who command of strategic regions of the country reiterated their “absolute loyalty and subordination” to the socialist leader in messages carried on state television. The United States on Wednesday recognized Venezuelan opposition leader JuanGuaido as the interim president, urging the overthrow of leftist President Nicolas Maduro following tainted elections and a spiraling economic crisis. In a coordinated bid to oust Maduro, Guaido declared himself acting president during a mass demonstration and within minutes was recognized by President Donald Trumpas well as the Organization of American States. Maduro has repeatedly blamed the nation’s woes on the United States, which he accuses of plotting a coup in a continuation of the U.S. history of meddling in Latin America.